I have recently released my very own (and first) Android App and it’s called Insurance Returns. 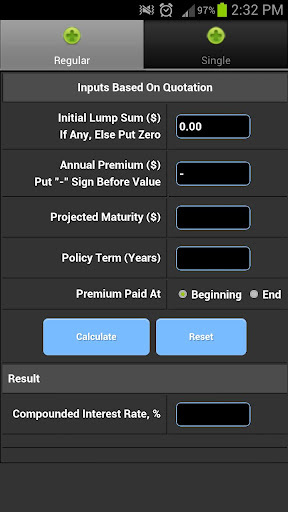 And if you have an Android Phone/Tablet (preferably those 10.1″) and you are looking for an App that can help you to calculate the compounded rate of returns for your Regular Savings Plan or Single Premium Plan, you can try out this app today! And these numbers do not give you the full picture – e.g. if you know that this plan will just give a compounding rate of return of 1.1% p.a. for 20 years for a regular savings insurance plan – which you will be better off with other type of plans (e.g. 1% p.a for 3 years which come from a certain bank ) or save it for other savings tools (e.g. property). You can definitely financially plan better for yourself and not live to regret that this plan is not helping you to retire or to plan for your child’s education! With the Insurance App – you can basically use the information on those quotation and get the actual rate of return. With this information, you are better off comparing whether it makes sense for you to go to other Financial Institutions and check out their plans or even assess yourself and ask whether you should set aside this money with this particular plan when there’s economic factors like Inflation to take note of. I believe with this App, Financial Planners can use to explain and present their quotations better. They can always use their Financial Calculators but to their Prospects, they can only see them pressing PV, FV, PMT which may make no sense. But with this App, you can see them keying in amounts into fields that they can relate like Annual Premiums, Single Premium, Projected Maturity and Policy Term. So I do hope that this Android App can help for both the Consumers and the Financial Planners. If you are downloading it and you like what you see, please do give your ratings on the Google Play store. Feedback and Suggestions are welcomed as well!